A delightful concoction of implausible coincidences, innocent spying, interconnectivity, and childish pleasures. I can’t quite stomach the excessive amount of sweets being served as main meals but I imagine my younger self would have been quite fascinated. The candy making process and rules are highly entertaining, and perhaps even informative! As most Wendy Mass books, this one is all about how to appreciate one’s life and accept one’s lot while still strive to expand understanding of the world around. No wonder my students love it so much and it appeals to both genders and mystery and friendship book lovers. Basic Content Information: 17 year-old girl, former prescription drug addict, recovering from two traumatic events in life: surviving a car crash at age 14, leaving her crippled and scared (does not hinder her attractiveness from others); her best friend, a girl who is a faithful Christian withholding her dark secret of being a lesbian, was murdered in front of her — now will have to face distrust from parents, police, her best friend’s brother, and at the same time piece together the evidences that will lead her to the identity (and hopefully arrest) of the murderer. The book is told in present tense, first person perspective, chapters alter from present to a moment in the past (still told in present tense) that reflects, affects, or triggers events in the next present day chapter. It is a murder thriller and a love song in a very leisure pace. It has the longest, most boring exposition section of pretty much ALL the books I’ve ever read. The tedious laundry lists of the company and personal histories that do not propel the story and also do not really illuminate the personalities that much more made me want to just KILL the audio! I find neither of the protagonists portrayed convincingly to fit the author’s high esteem of both: Mikael does not quite “show” how he is the most moral person as proclaimed by other characters and the narrator; and Salander seems to me more broken and angry than badass and vulnerable. I really don’t find her appealing. But, hey, I’m not a fanboy/fanman of this character. I am not particularly squeamish or prim when it comes to book/story contents — as long as I feel that whatever details or events included in the book serve some literary, storytelling, or creative purposes. But for some reason, the portrayal of Salander (the female protagonist) really bothers me — her “toughness” and lethal personalities, mixed with her supreme helplessness and brokenness are all probably very realistic (I’m no psychoanalyst) and yet this mixture does not appeal to my sensibilities at all. 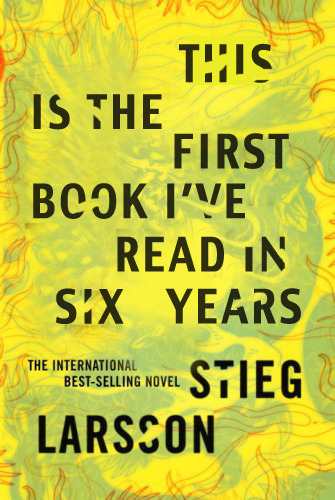 The fact that so many young and middle-aged men highly recommended this book to me, and especially expressed their appreciation of Salander as a cool character made me actually uncomfortable and worried. This, along with some other children’s and Young Adult books I read in 2013 featuring “tough girls” made me start pondering about the current trend of readers’ readiness and urge to applaud tough female characters in books. Because, it seems to me, that instead of patience, resilience, open-mindedness, what I consider true strengths in human spirit, many authors have been creating vengeful or single-minded “tough” female characters whose most prominent and “appealing” personality is rooted mostly in aggression: a traditionally (and physiologically?) masculine trait. What are we applauding then? Are we praising a female character because she is free to be “whomever” she wants to be, liberated from the traditional and “weak” traits associated with femininity – or are we just saying that she is to be lauded because she behaves more like a male specimen since masculinity is clearly superior? I will be reading many many 2014 Young Adult books this coming year and how young women are portrayed in these books will be something I pay special attention to and report here.